Will has had the intestinal flu since Saturday evening . . . Chills, sweats, fever, etc. etc! My poor Baby has it bad! His temp ranges from 102F to 97F! How do you care for someone who feels generally awful? I have found creative ways to keep liquids in him ~ homemade popsicles, flavored gelatin, ice water, potato soup, 7-Up and the latest . . . Pedialite. When Will is shaking violently and feeling chilled to his core, I wrap him in a down comforter and pack homemade rice-packs around him that I've warmed in the microwave. Lots of rest ~ If given half a chance, the body will heal itself . . . Will has been sleeping about 18 hrs a day! It's pretty quiet around here. Soft foods ~ today I made clam chowder, per Will's request, but then the smell bothered him. He was only able to eat about a cup's worth, as well as, a half a cup of homemade custard and orange gelatin. I am also giving Will a Multi-lactobacillus capsule to help keep the flora in his gut healthy. Fresh, clean sheets make his stay in bed much more comfy! For your safety, wash your hands often with soap and warm water. Have a designated bathroom for your use only. Nice comforting baths and showers make an aching body feel better. Change the bathroom hand towels daily. Acetaminophen, to help with fever and aches ~ be sure to help your patient keep track of when he/she is supposed to take their meds. Don't give more medication then perscribed . . . an overdose can have serious consequences! When tummies are out of sorts this gentle custard hits the spot! Heat up boiling water for a water bath. 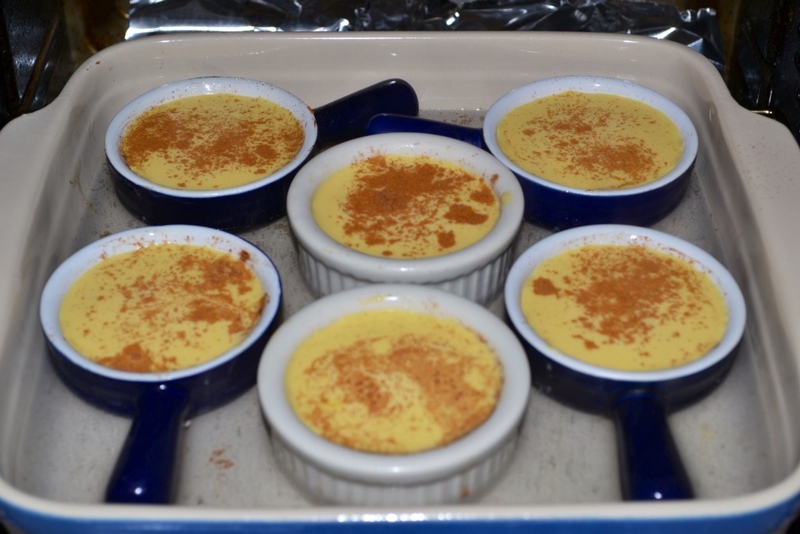 Divide custard evenly among your cups and sprinkle with a bit of cinnamon. 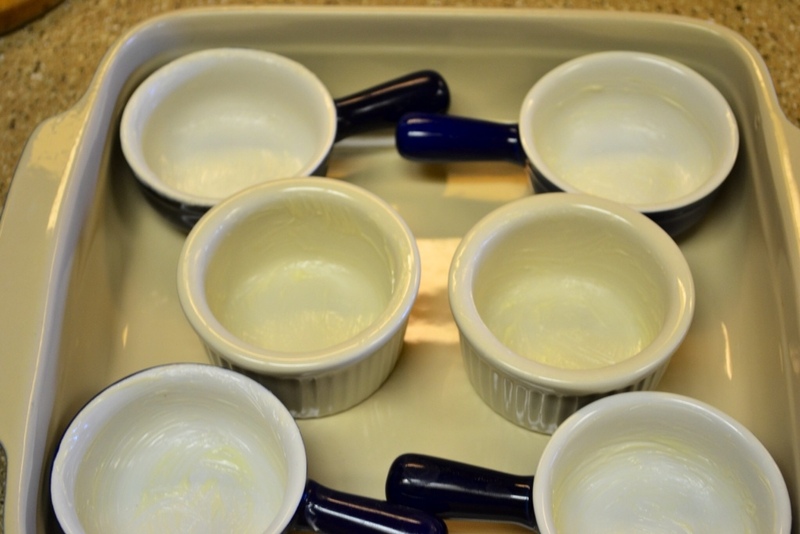 Place cups in a baking dish, place in the oven with the rack still pulled out. 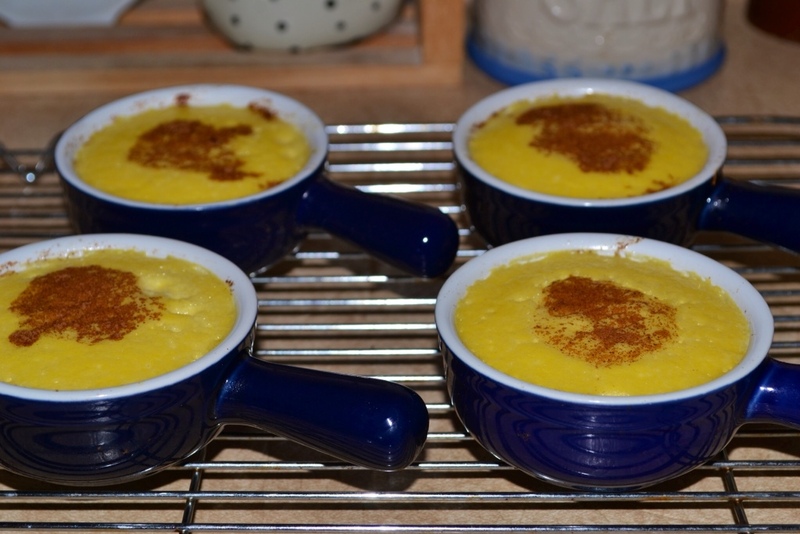 Pour boiling water half way up the sides of your custard cups. 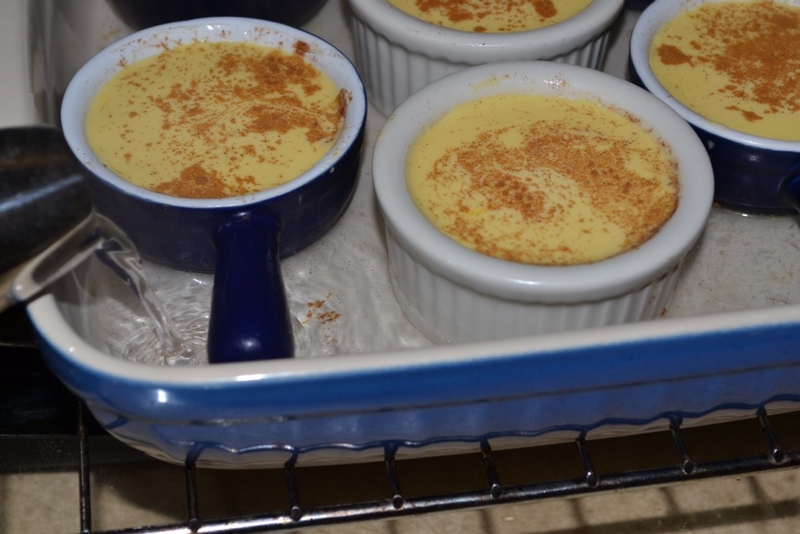 Carefully push in the oven rack and bake 1/2 cup custard dishes 20 minutes, smaller cups 14 minutes. Test for doneness by inserting a sharp knife in the center of custard, it should come out clean. Use a canning jar lifter to remove custards from hot water bath. Butter custard cups with space between each cup. Pour boiling water carefully, half way up the custard cups to form a hot water bath (notice the tea kettle spout in the left front of photo). It is never easy taking care of a loved one who's not feeling well, but it does give us an opportunity to minister to their needs while they are in a weakened condition. Remember to keep your priorities straight. The housework can slide for a bit . . . The important thing is providing support for your patient, physically emotionally and spiritually. And remember, take good care of yourself and get plenty of rest! This is temporary, and life will get back to normal . . . Over at Julie's and over at your place too!!! Gentle comfort food for the ouchy tummy.